Quick share of my recent experience going to Nairobi and things to look out for. Took Kenya Airways flight from Bangkok Suvarnabhumi Airport to Nairobi. What was supposed to be a straight forward two hour lay over turned out to be a flight delay of eight hours. While it was quite frustrating to only find out at the counter, the good thing was the airline arranged for affected passengers to stay at the nearby Novotel hotel which I must say is quite nicely decorated and comfy for a transit hotel. The complimentary breakfast though was mostly just passable. As for the flight on Kenya Airways, it was pretty straightforward. Towards the end of journey though, the interior lighted up in rainbow colours, which was quite interesting. Speaking of going to Nairobi or in fact, most parts of Africa, do take note that it is advisable for visitors to get yellow fever vaccination prior to the travel. In fact, the customs officer may spot check by asking to see the International Certificate of Vaccination, which is a small yellow booklet. While I did not get asked at the customs, I did see another traveler being asked for the booklet, and it seemed that because he did not have it, he had to pay a fine. Another interesting phenomenon to note is related to payment. In Kenya, mobile payment is very common. In fact, they are so popular that most locals do not carry much money these days. The main service is known as M-PESA owned by Safaricom, with the other telco operators also offering similar services. You will need a Safaricom sim card and passport to apply and start using the service. If you prefer to continue using conventional cash, do note that the smallest paper note is 50 shillings, while coins are in denominations of 5, 10 and 20 shillings. If you are like me, you will most likely only have big notes from the currency exchange. This means difficulties in getting back small change when making payments. This is most evident when taking taxis, most drivers do not have much coins these days. That's why for rides, expect to round up in multiples of 50 shillings. Your hotel's reception desk may be able to help you break a big note into fifties but it would most likely not have change for small coins too. Otherwise, just treat the small change as giving a tip. Another option for transport that I will recommend, at least upon arrival at the airport, is to use Uber. While you can choose to pay by credit card if you do not have enough cash, the main advantage is the pricing compared to other options. At the airport, the only licensed airport taxis are Yellow Taxis, which I have been told have hefty charges. The second option is the street touts lining up at the exit door, purporting to be better and cheaper than the Yellow Taxis, but end up still being quite expensive. For comparison, from the airport to my hotel, the street tout charged me 2000 shillings. For the reverse trip back to airport, I called for Uber and boarded at a further location, and yet ended up with only a 1000 shillings ride. Outside of the airport, taxis may not be easily found, so Uber is a hassle-free way of getting from point to point. Last interesting thing to note is how some public holidays in Kenya depends on sighting of the moon. This means the holiday could be declared very suddenly and could disrupt your plans, which was what happened to me. A public holiday was declared two days before my trip but I had not realized that until I arrived at the airport. As a result, the event that I needed to attend got postponed too. So my business trip which was originally meant to be a two days quick turnaround got extended by another two days. So do take note to check local news a few days before your travel to see if something like this would happen during your period of visit. 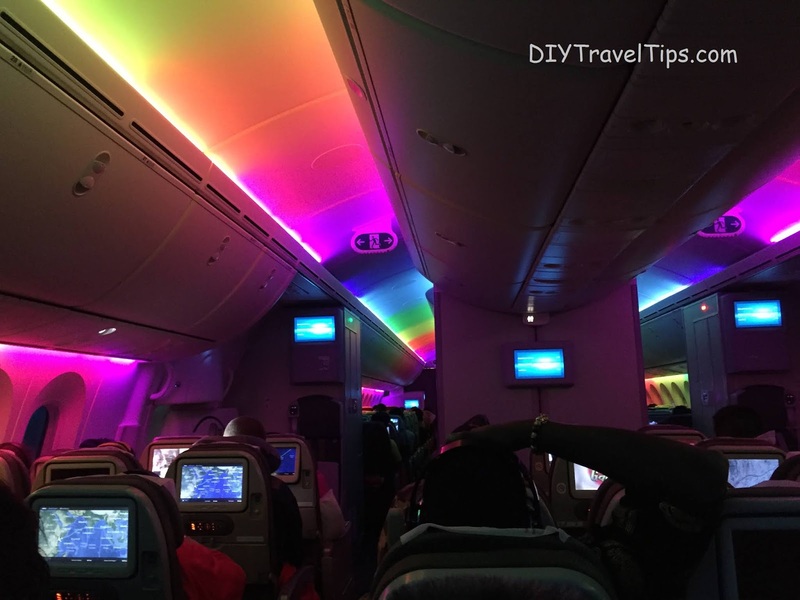 I recently flew Etihad Airways for a business trip. Due to schedule reasons, I had to purchase the departure and return separately. This post is not so much of a food comparison, rather to give a general idea of the differences and what to expect. For the departure, I had purchased direct a late night flight from the airline website. I must admit there were a lot of choices when it came to meal selection. However, most of the choices were pretty heavy meals unsuitable for a night flight, or vegetarian based which did not appeal to me. If you have flown Etihad before, you may have faced the same dilemma as me. In the end, for the lack of other options, I took a gamble with the Gluten-free meal (code: GFML), not that I had any particular diet control or food allergies. I was pleasantly surprised that it turned out to be turkey and potato, cooked in a style that I was more used to. In exchange for rice/noodles, the staple food was the middle cracker item like below. Wrappings removed. Not too bad huh? As an added bonus, I got to eat before other passengers since it was considered a special meal. 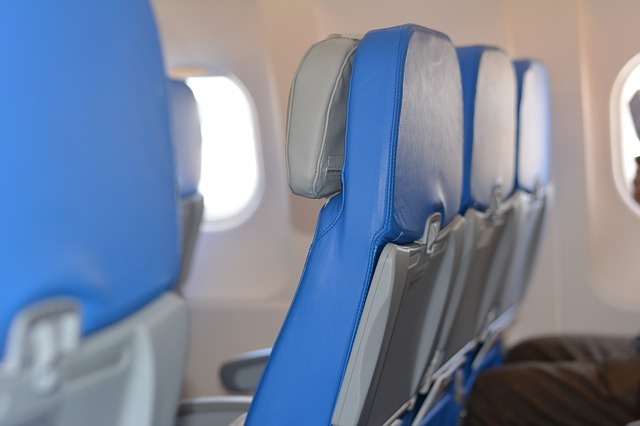 I always find eating on flights a rushed experience, especially if I am seated on one of the last rows to be served. Flight attendants usually start clearing soon after the last rows are served, so I would always feel the pressure to rush through the food. Hence, being served ahead of other passengers gave me extra time to enjoy the eating experience. The Gluten-free meal's overall portion was also just nice. I do think though that since it is considered a special meal, unless you have ordered it beforehand, it probably will not be available as a food option during flight. On my return trip, I did not get to choose my meals because I bought from Expedia. Hence, I could only take whatever general meal was provided during the flight. I could notice the difference since I had to wait much longer while the flight attendants distributed row by row. In fact, by the time it came to my row, one of the two choices were out. So I had to settle for the remaining choice left which was Nonya styled chicken with vegetables and a mango flavored sago desert. I am not sure what food code this would have been on the airline website, but it mostly turned out to be quite nice too, as you can see with the wrappings removed. 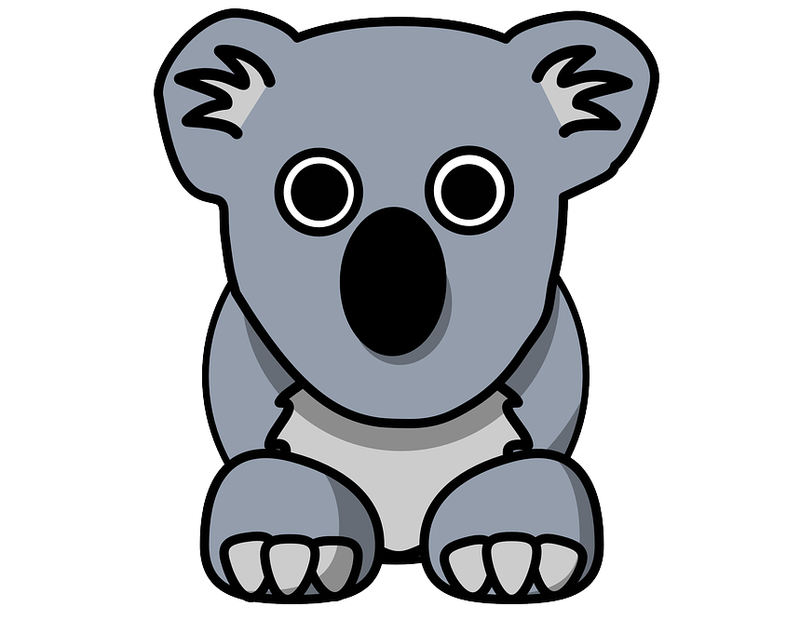 The Missus had wanted to look at the iconic animals of Australia: Kangaroos and Koala Bears. You would have thought it should be easy to find in Australia, but as fate would have it, we did not get the opportunity at all. 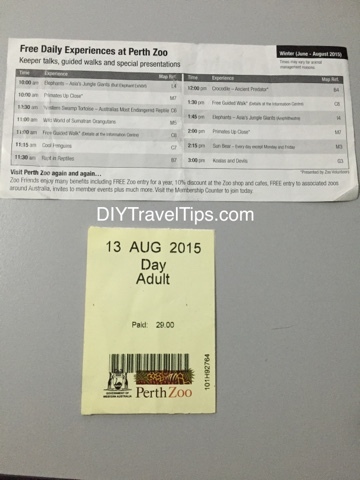 But first, let's talk about getting to Perth Zoo, which is the straightforward part. The easiest way would be to get to Elizabeth Quay Bus Station. You may hear other references to it as Esplanade Busport, its old name before it was renamed in Jan 2016. Since this is a busport, lots of buses in Perth starts or ends at this station, so you should have no problems getting here. Once you alight from any bus, find your way upstairs and you should find yourself somewhere similar to the photo below. It's not a big place, you should easily locate the information counter. 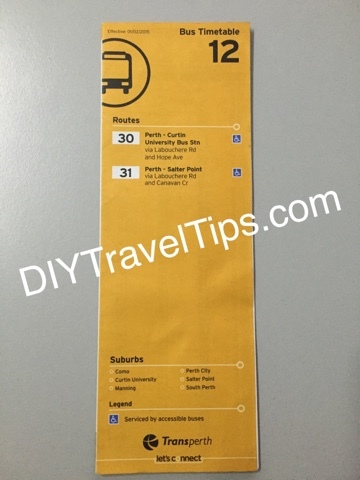 I will discuss in another thread about the Perth transport system, but meanwhile stop by at the colourful timetable booths and grab a copy of Bus Timetable 12 for Bus Routes 30 and 31, which goes to Perth Zoo. You may want to grab other timetables for other places of interests you have planned for. If you have any queries, you can also ask the friendly staff at the information counter. Pro Tip: Grab a copy of the "Tickets and Fare Guide" from the information counter as well. Other than bus fares, it also contains a Transperth Zone Map which will help you to estimate your bus fares. Once you are done with the timetable booths, it's time to head down to Platform E3. 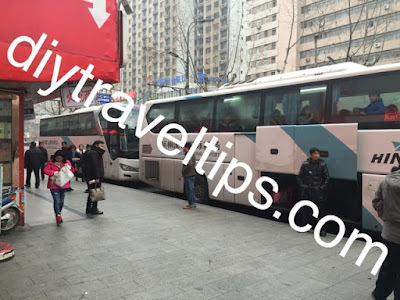 The waiting area for Bus 30 and 31 is the same, so just hop on the first bus that comes along. The trip is a quick 5min and will be a 2 Section fare. You will stop directly outside Perth Zoo (Stop 11847). 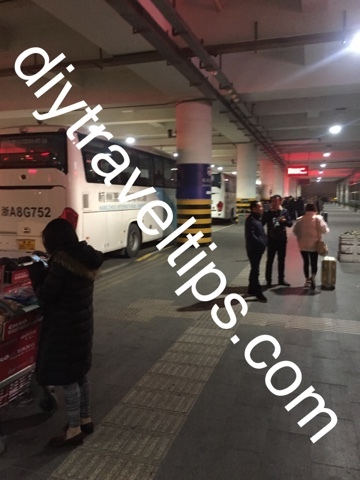 The return bus station is just on the opposite side (Stop 11865). Adult tickets are $29, Children (4-15 yrs) are $14, under 4 yrs is free. 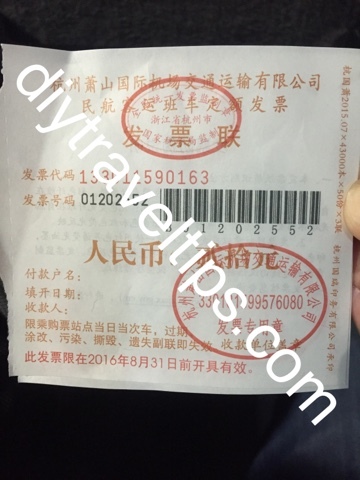 There is also a Family price of $75.20 for 2 adults with 2 children. You can find other ticket types from this link, but they may not be applicable to foreigners. Pro Tip: You have to pay for the printed map if you get it over the counter. Do yourself a favor, download and print from the zoo website before hand. Alternatively, there is a big map display just few steps into the zoo, snap one with your camera. You will also get a copy of the timings for guided walks and feeding presentations when you purchase your tickets. You can also find the latest list online here. The earliest one starts at 10am, the last one is about 3pm. So try to be there earlier, especially if you are bringing kids along. To be frank, Perth Zoo is not big, there's not a lot variety of animals. You can expect to finish touring within half a day unless you intend to stay until 3pm for the last presentation. So you will still have time to plan for some other places to visit. 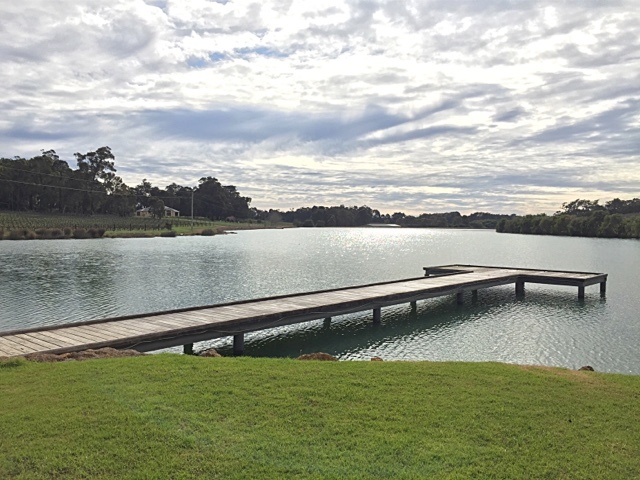 I recommend combining it with an afternoon's visit to Kings Park since it is near Elizabeth Quay Bus Station and on the way back. So back to my earlier rant on Kangaroos and Koala Bears. Busselton and Dunsborough did not offer us any places to see these animals. The first place we could find them was Albany Wildlife in Discovery Bay, which was disappointing and a story for another day. Undeterred, we decided to try our luck at Perth Zoo. Only to find out that the Koala Bears habitat was under construction and the Koalas were relocated elsewhere and not for visiting... zzZZZzz.. So moral of the story? 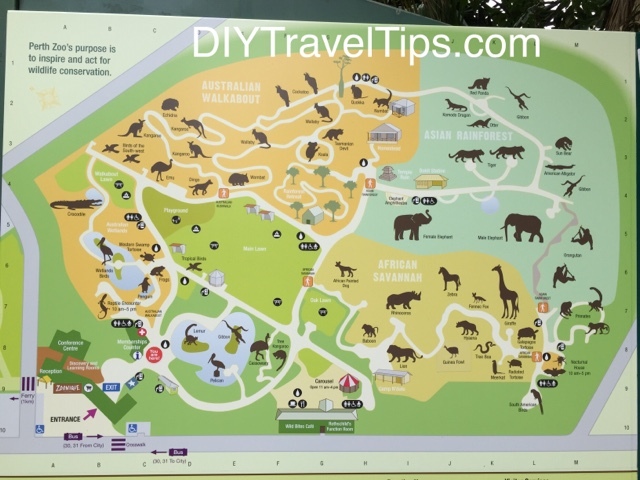 If you intend to visit the zoo, do a check (via a call maybe?) if any of the animals are not open to public. So says Murphy's Law, and we should respect his wise words. You never know when life might hit you with the unexpected. So it pays to be a little more prepared so that you can tilt the odds in your favour. Honey, where are the travel documents? Packing the bag doesn't sound exciting, does it? But nothing ruins a trip more than when you discover something left behind and the panic arguments starts. For the lazy travellers, try to start packing preparations at least a week ahead. Bring out your luggage bag and put it in an accessible corner. 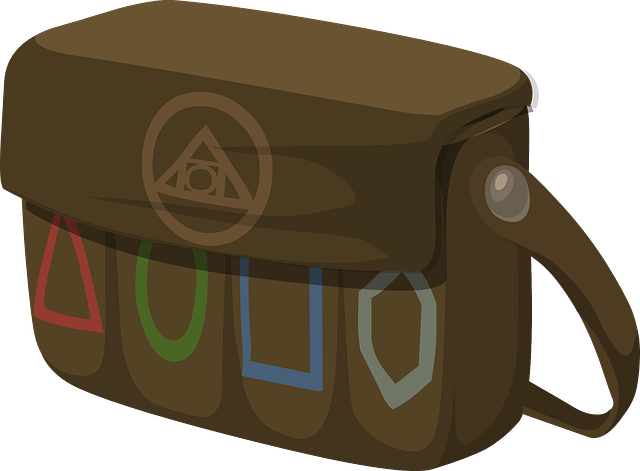 Whenever you think of something important for the trip, put the item in the luggage first. That way, you will not need to keep reminding yourself or keep a mental list of items, which tends to be the easiest way to forget things. Doctor, can I have some painkillers? Falling sick overseas is quite common. Being in a new environment, the weather, the food, the flight, all these may cause you to feel under the weather. Even some minor cold or discomfort may affect the rest of the trip. But having access to medication in a foreign country may not be easy. 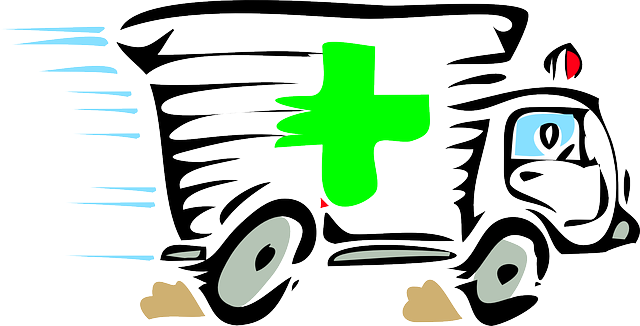 Even if you can find a local pharmacy, the medication may not be something which you are used to back home. 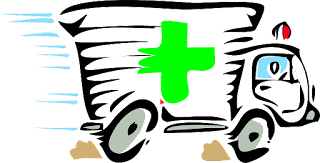 Whether you are contemplating to spare some space for your glory purchases, or just prefer to travel light, it is still advisable to pack some common medicine for minor discomfort like painkillers, flu, motion sickness. The last thing you would want is to let a headache ruin a perfect trip. Hmm.. now where did I keep those blue pills? Ever tried searching for something but could not find it, only for it to pop up somewhere else later? You are not alone. Similar item types should be grouped and put together so that you can always return to the same location. So for example, medication can be put in a small bag or container, while another bag can be for electronics related items like mobile phone chargers, travel adaptors, camera equipment. 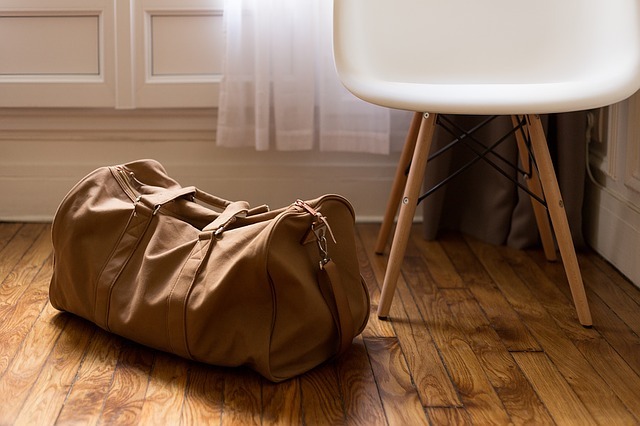 Keeping these small items in their own bag also ensures that you will not forget to pack them on the last night of hotel stay. Think of this scenario: After getting off the plane at your destination, you confidently pulled out your mobile phone. You had done your homework beforehand and know the airport has free Wifi services, so you did not bother to print out your hotel booking for address location. After walking around to find a spot with stronger signal, you finally connect to "Free Airport Wifi". A page greets you, asking for your mobile number to send a 4 digit password via SMS. You try entering various combinations of your country code + mobile number. But the system keeps giving you "Invalid mobile number" message. With a sinking feeling, you finally realised it can only send SMS to local numbers. Whether you like your documents in hard or soft copy, at least prepare another copy in the other medium. 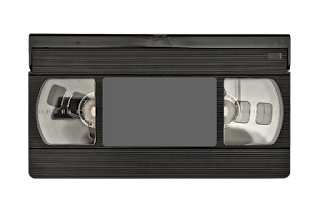 Having different copies means you are in better control when you could not access one. In similar vein, take a photo of your identification documents like passport and driver license so that you can still proof your identity even if you accidentally lose them during the trip. 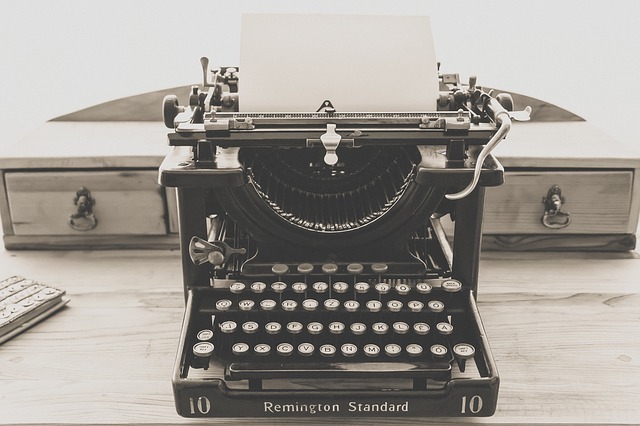 Have you asked for a pen and paper during a trip before? Sounds common enough? Since it's so common, why not bring a pen and some pieces of paper to jot down information. Extra tip: Pack your writing materials with your travel documents and itineraries in a small file or bag that you bring around with you. You may be surprised at just how often these things are required together when the situation arises. These days, mobile phones are becoming the gadget for communications, entertainment and photography. Some even use it as a GPS navigation tool. 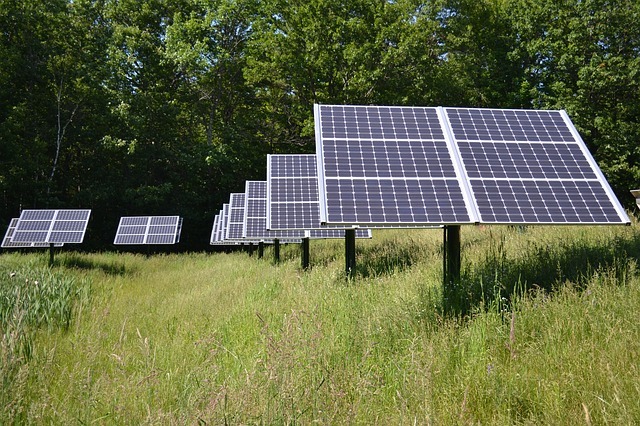 With so many uses, it's no wonder portable batteries were invented to keep our devices running. Have a spare portable battery charger and you will never miss out a photo opportunity. 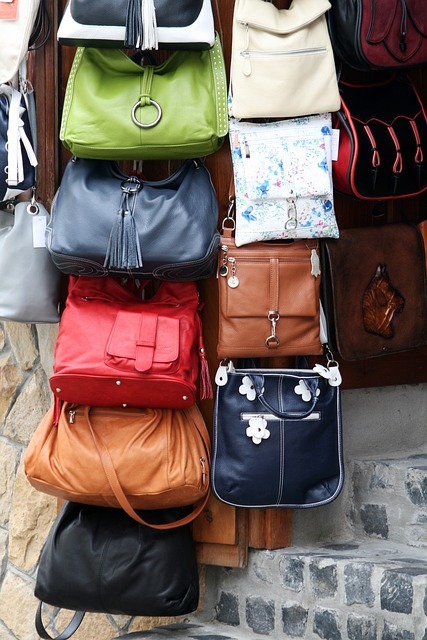 "These ladies handbags are foldable so that you can bring more home"
Be it souvenirs or local food produce, more often than not, you end the trip with more things than you started. During the packing, you discover the main luggage bag that you brought is not enough to hold everything now. You start regretting not having brought along a second bag. Why not bring an extra foldable bag? 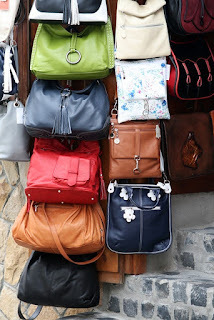 Such bags do not take a lot of space, and helps ladies to increase your carrying capacity for last minute purchases. Extra tip: Pack your clothes into the foldable bags as carry-on baggage, and you will have more space in your check in baggage for your fragile purchases. Can you help to translate this? Excited about going to an exotic place? 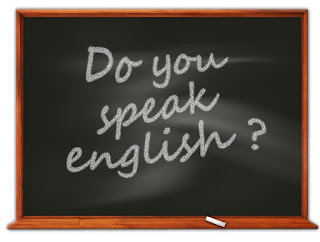 Don't let language be a barrier. Finding someone who speaks your language may not be easy. Avoid playing charades overseas, write down the names of those places you intend to visit on a piece of paper, find their native equivalent names. Or bring along a guide book for the lazy. Hangzhou 杭州 is a beautiful city and frequently depicted in many enchanting Chinese stories, home to many famous poets. Its most famous icon, West Lake 西湖 and its surroundings, are home to many places of historical significance. It is also home to Alibaba 阿里巴巴, the Chinese e-commerce giant. 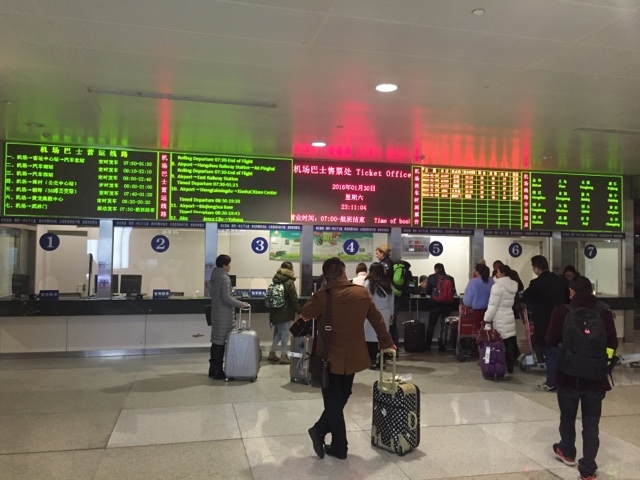 Hangzhou's only airport is Xiaoshan International Airport 萧山机场 which serves both domestic and international travellers. It is not a big airport and both terminals are just side by side. 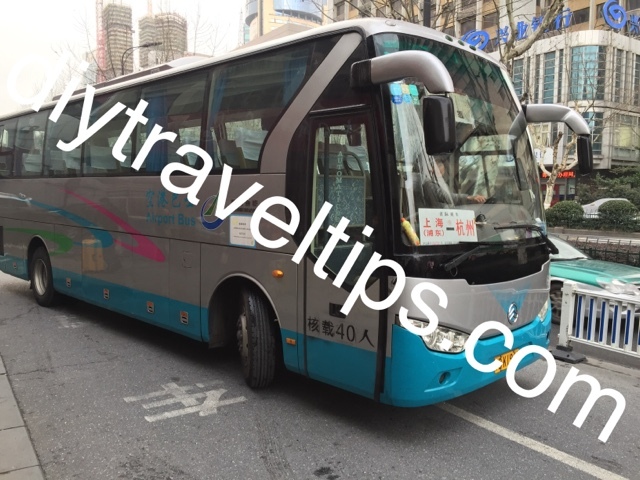 To reach the city, you can go by taxi or airport bus. It is a small airport so you cannot miss the long queue of taxis outside the arrival hall. Taxis rides are metered so you do not need to entertain any touts or haggling. This would be a good option if you are travelling in a big group or have a lot of luggage. The alternative would be the airport bus. The ticket counter is at Level 1 of Domestic Airport, which is to the right and just next to the International Airport. Once you are at the Arrival Hall of the International Airport, you can either continue walking out of the airport and take a right, or take the lift up to the Departure Hall at Level 2. 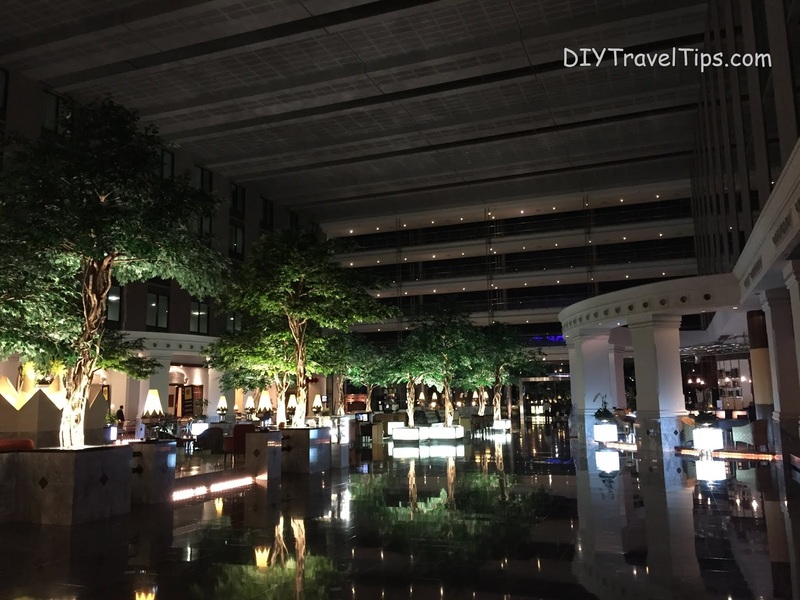 From there, walk across the connecting hallway to Domestic Airport. Once there, take the lift down to Level 1. The ticket counter is a little further up. You can't miss the big display boards like below. If you do not know your bearings in Hangzhou yet, the more central stop would be Wulin Square (武林门). All ticket prices are RMB 20. From Wulin Square, you can hop on to a cab to your next location. Once you have your ticket, exit the airport and turn right to see this scene. 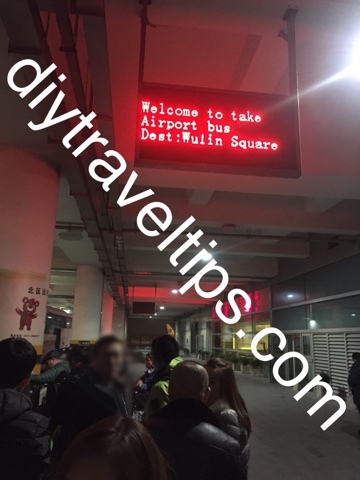 Boarding is at the signboard which displays "Dest:Wulin Square". You just need to give your ticket to the ticketing lady who is easily recognized in red. She will tear off and return you a slip like below. Pass your big luggage to the guy at the storage compartment before you board the bus. 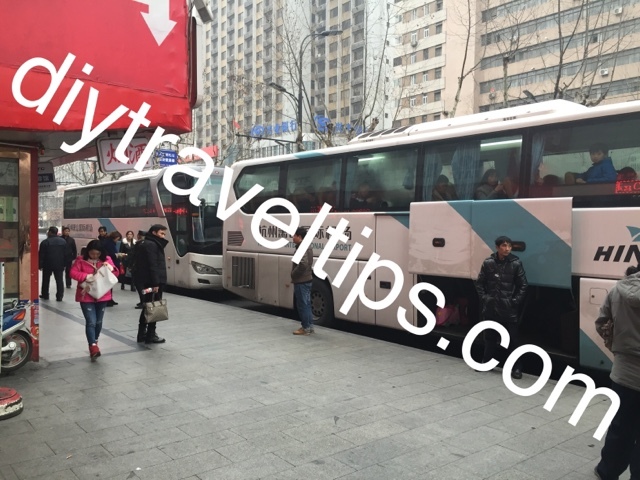 It's free seating so just pick your most comfy seat, sit back and relax for 50mins or so to Hangzhou city. The ticketing lady will also start selling hotel rooms and tour packages, if you have not made any plans. 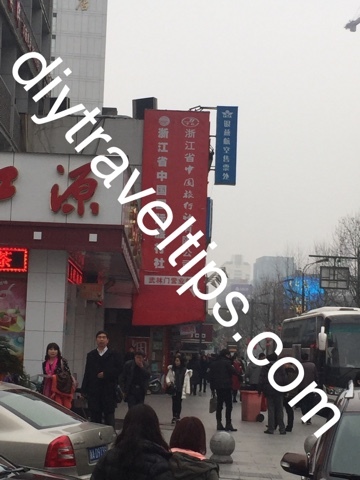 However, there are a few boutique hotel chains near Wulin Square where you can usually just walk in and get a cheap room for the night. 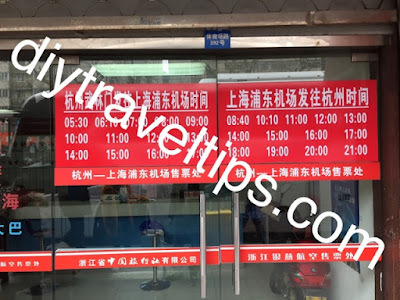 The drop off point will be near "Hang Zhou Xiaoshan International Airport Ticketing Office", 杭州萧山国际机场售票处, where you can get ticket for the return trip to Xiaoshan Airport. Bonus tip: This is also the place where you can get tickets to Shanghai Pudong Airport, 上海浦东机场, details below. 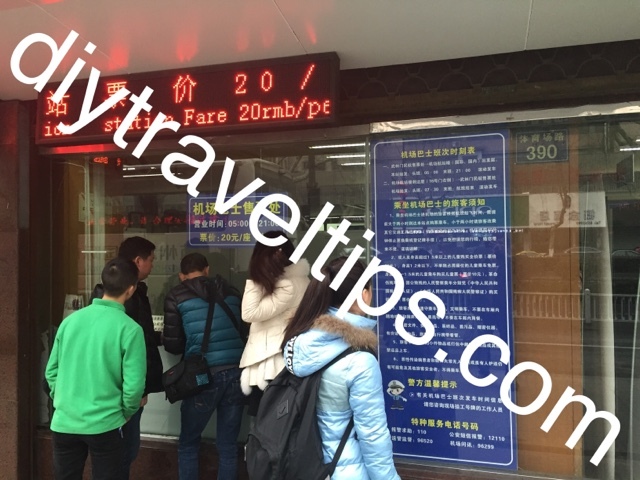 Once you spot this big red banner, the ticketing office is just two stores away. You should see one or more airport buses parked along side the road. Just get on the first bus after you purchased the ticket. Buses leave every half hour. Ticket price is RMB 20. For the folks going towards Shanghai Pudong Airport, you can get the tickets next door where you will see this sign board below which indicates shuttle bus departure and arrival timings. Left is from Hangzhou to Pudong Airport. Right is vice versa.